In about November of 1990, I looked into getting a Pinewood Derby Timer for my son’s Cub Scout pack. I studied the ads in the back of Scouting magazine (before the Internet), but those timers appeared to cost too much and do too little. So I decided to design a timer myself. After that initial prototype, I debated with myself whether or not I should sell the timer to a larger market. I made a decision to offer the timer, and that is when Micro Wizard and Fast Track Timers began. The results should be consistent and repeatable, and should display a tie if the finish is ambiguous (more on this below). The results should be displayed at the finish line so that everyone can see them as the cars cross the finish line. Nothing should touch the car at the finish line. We use a photo transistor and an infrared beam. The finish line should be thin and tall, so everyone can see the cars as they cross the finish line. To keep the apparatus simple, the electronics should be built into the finish line structure. The whole package should look good. The timer should be a stand-alone unit and not require a computer to function. The timer should have the option to interface with a computer, so the race data can be stored and managed with software running on the computer. Although Micro Wizard did not offer any software to manage the races at the time, I felt this was an important option for the future. Sensor Occlusion – Even when sensors are of the same type, slight variances exist between sensors as to the amount of occlusion (blockage) required before the sensor triggers. In addition to the sensor itself, the shape of the front of the car, the color of the paint, the height off the track, et al, also affect when the sensor will trip. Sensor responsiveness – Similar to the above, other factors can affect the responsiveness of a sensor, causing slight variances from lane to lane. These include: temperature, air drafts, vibration, etc. Sensor placement – Regardless as to the amount of care used when mounting the sensors, there are usually slight (thousandths of a inch) differences in sensor placement from lane-to-lane. This can lead to one or more lanes producing faster results. Track issues -Track expansion and contraction, and other construction issues can lead to lanes being slightly longer or shorter. This produces faster results in certain lanes. Start line issue – Similar to the above, the starting line can impart slight advantages to one or more lanes due to placement, drop speed, etc. Given the above factors that affect performance, measuring to the ten-thousandths of a second (equating to less than 1/8 of an inch at the finish line) can produce erroneous results. So what is the best way to measure? At Micro Wizard, we issue a tie whenever two cars finish within 0.0002 seconds of each other. Even though our sensors and sensor mounting are as accurate as possible, 0.0002 seconds is the closest measurement that can be determined with reasonable accuracy. Thus, any race where two cars are closer than 1/8 of an inch will result in a tie at the finish line. Jordan and I decided to build the Wing upside down to have greater access to the weights. Since this was our attempt to try to win we were not sure how much time we would have if the car was under or over the limit. I was talking to Jordan about this concern, and Jordan said “Why don’t we turn the car upside down to get to the weights.” Well it worked. Jordan was the reason we won with that idea – at least I want to think so. Last year we built the Low-Rider and it finished second in the pack and (after some work) first in the district. This year we designed our own car. It will be a surprise as nobody has seen it yet. We had a few sons and fathers come to my shop to work on cars, but we kept Jack’s tucked away. Jack likes the suspense, and can’t wait to unveil his car. There are a lot of fathers and sons in the pack waiting to see what we came up with. I don’t know how his car will finish, but I’ll be very surprised if anyone beats him. He worked very hard on it and I think it is going to be a very fast car. The design idea for this car was totally from my son Hunter. He is 5-years old, so he must race in the adult division at our pack race. He really likes all things military, but especially tanks. 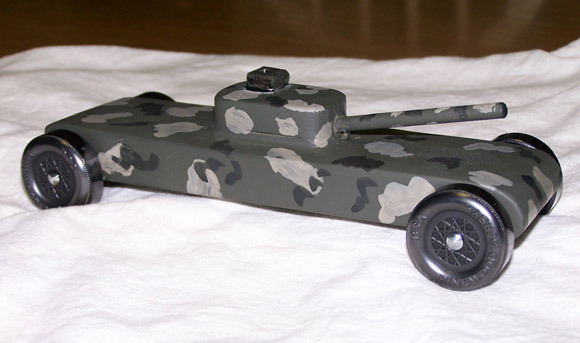 When I asked him to decide what he wanted his car to look like, he said “a tank” without hesitation. We cut the block on both ends to leave the center section, then used a Dremel tool to round the top to make the turret. We then used a dowel rod for the barrel, drilling a hole in the turret and gluing it in with wood glue. We weighted the car internally using 3/8 inch lead weight by drilling holes through the body and then using wood filler to seal the holes. We used the Pro-Hub tool to polish and angle the hubs and the Pro-Body tool to relocate the axle holes to their farthest possible locations on the block. We used the other Pro-Tools as well. The weight placement had the car balanced about 1 and 1/4 inches in front of the rear axles. When we got to the race the official scale showed the car 0.15 grams light. That’s when we added a lead piece on the top as the turret hatch which put the weight at 5 ounces. The tank came out smoking fast and was clearly outrunning the other adult built cars by about two car lengths. The only other car close was the scoutmasters, who ran a pretty close second. As they were calling the winners names my son said he wished he would win a trophy. Then about a minute later they announced him as the winner of the adult class. Needless to say the look on his face was worth a million dollars! 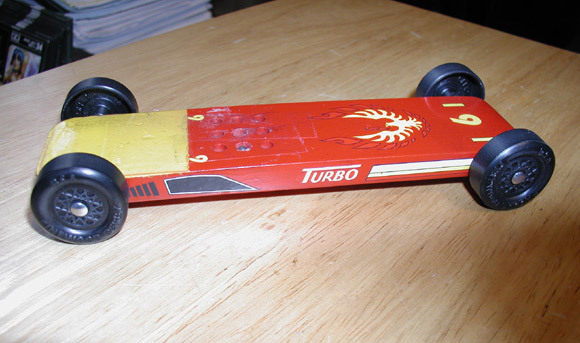 I was eight years old when I participated in my first pinewood derby. My father carved a simple car with a pocket knife, I sanded it and installed the wheels. I remember not having any powdered graphite so all I could do for lubrication was to rub a pencil lead on the axle nails. I was so excited when race night came. I was even more excited when my car took first place. I received a small trophy that I remember clutching, not wanting to put it down. My father passed on just 4 short years later. The memories I have of him working on my car and the night at the races are some of the most treasured on my childhood. The trophy I won that night became one of my most prized possessions. Although I have moved many times and parted with many possessions, I still have my little blue and gold trophy. Thirty years have passed now. Last year my own eight year old son, Jeffrey, found my pinewood trophy. He was in his first year of Cub Scouts. He loved my little trophy and wanted to try to win one of his own. I told him that winning wasn’t everything and that the real fun was in making and racing the car (but deep down, I remembered how excited I was when I had won when I was his age). So we decided we would work hard on his car for the upcoming race. We found a construction tip book and I got some friendly pointers from some of my friends who also had kids in scouts. Jeffery came up with a simple but sleek design. I cut the car with a jig saw and Jeffrey sanded it. We filed the burrs of the axles and smoothed the wheels. After lubricating the wheels and doing our best to make the car go straight, it was ready. Race day came and I could see the excitement in my son’s eyes. His car ran six heats and won every one. He ended up third in his age group (based on total time) and 7th out of 75 scouts overall. Not bad for his first year. He received a medal for his third place finish (only the overall winner received a trophy). My son had fun, but he wanted to race again and have another chance to win a trophy. He decided to race his car in the district races to be held in 6 weeks time. In the mean time, we worked on his car, correcting an alignment problem with one of the front wheels. One of the wheels had come loose during the Pack race and now continually pulled the car to the side. We had to lift it off the track completely to make the car go straight. There were several very fast cars at the district race. The track record was tied and then broken in the early heats. My son’s car performed well, winning every heat and tying the track record in the process – the wheel repair seemed to have worked. I knew his times were fast and we were on the edge of our seats when the winners from each age group were announced. My son won 1st Place for the Wolf age group. He was presented with a small blue and gold trophy much like mine. The smile on his face was priceless. After the awards were handed out for each age group, the top four cars in each age group were raced again to determine the overall winner. My son’s car won two of four heats and was just barely nosed out by less than an inch in the other two. But He won 1st Place overall in the district with the fasted combined four heat times. This time he won a bigger, all gold trophy. When he brought both trophies home to show his mother, I think he was the happiest kid on earth. I have since given him my trophy and all three are now proudly displayed in our home. 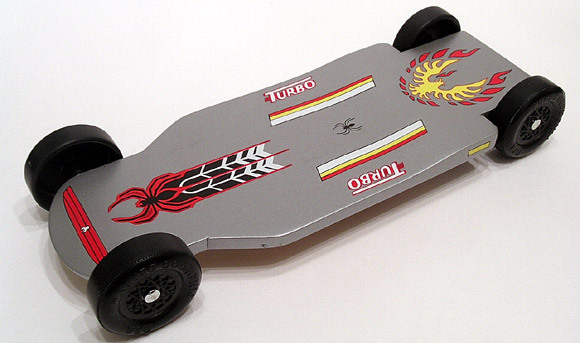 We are now preparing for this year’s pinewood derby race. Whatever the result, the memories of my son’s first year racing are unforgettable, for both him and myself. I am a Cub Scout Dad who has built about 10 cars now with varied success. Our cars have received trophies 5 times but the other 5 cars were duds. We still have 2 years of building left before we call it quits. I read an article today suggesting putting weight in the wheels as opposed to the body. Any comments on this? This idea has been suggested a few times, but all of the testing I have seen has shown that weighted wheels can only benefit if the track is extremely long. What happens is that the weighted wheels cause the car to start slowly, but roll further. So on the typical length tracks, the car falls behind immediately and can never catch up. In fact on the typical track, light-weight wheels produce faster times than heavier wheels. That is why people drill holes in sidewalls, undercut the tread, etc. This is also the main reason why the skinny outlaw-style wheels are so fast; they are extremely light. How do you recommend properly polishing single-rod axles? Our kits are the type with single-rod axles and I am trying to figure out how to grip the axle in the chuck of a drill or Dremel tool without burring or marring the gripped surface (which is the opposite-ended surface for the other wheel). I don’t want to un-do all the polishing on one end as I grip it to polish the other end. I suggest cutting the axle in half. That way you can polish without issue, and you can better set the wheel hub to car body gap. If the axles are in one piece, then the body width defines the gap (not a good thing). Another benefit is that you now have the option to raise a front wheel. Several years ago when I only had one of my boys in scouts, the rest of the family got to participate in the races and we bought pinewood car Kits from Hobby Lobby. The blocks of wood seemed to be made out of a less dense wood vs. the Official BSA block. The hobby shop cars consistently beat the cars that I’ve made in subsequent years. Is there an advantage to using a lighter block of wood assuming that it conforms to the BSA dimensions? I’ve theorized that it allows for a more concentrated weight placement. Lighter blocks can be an advantage, as it allows you to be more precise when placing the weight. That is why pineheads oftentimes search for the lightest car kits (which of course have the lightest blocks). People also ‘bake’ blocks in an oven to reduce weight. The hobby shop blocks you are referring to are probably PineCar-brand. The wood is poplar(1), which is a contradiction of terms since the company is PineCar! (1) The light easily worked wood of the tulip tree; used for furniture and veneer.